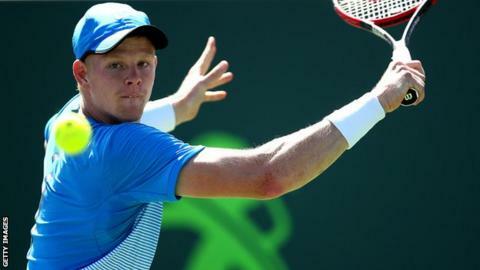 Kyle Edmund suffered a surprise defeat by Canadian wildcard Steven Diez in the Rogers Cup first round in Toronto. Diez, ranked 108 places below the Briton at 192 in the world, won 3-6 6-1 6-2 to claim his first victory in the main draw of an ATP tournament. Edmund, 21, was playing for the first time since winning both singles rubbers in Britain's Davis Cup win over Serbia. Meanwhile, Naomi Broady progressed but Heather Watson went out in the women's event, which takes place in Montreal. British number three Broady, ranked 84, defeated Puerto Rico's Monica Puig 3-6 6-4 6-2 and faces French Open champion Garbine Muguruza next. World number 67 Watson was beaten 7-5 6-3 by 2011 US Open champion Sam Stosur. Serena Williams, Andy Murray, Roger Federer and Rafael Nadal have all pulled out of the tournament, with Angelique Kerber and Novak Djokovic the top seeds.